Reference to Abbey Village, Kilnalahan and Lady Well is included in a book written in the French language by De Latocnaye who journeyed throughout Ireland in the year 1796-7 and which was later translated into English by John Stevenson. Before arriving in Abbey, he mentions Holy Island, Mountshannon and Meelick as he continues to Woodford and finally reaches Abbey. It is interesting to note that this French man arrived in Abbey less than ten years after the monastery had been abandoned by the Franciscan Friars. Frank Burke in his book ‘The Monastery of Kilnalahan’ states that in about 1790 the friars abandoned their monastery and gardens forever. He also states that while the younger friars moved to Meelick, it is possible that some of the older Franciscans remained locally in their home of refuge probably in Tomanynambrahar. From the account given by De Latocnaye these Franciscans were most likely still working in a pastoral capacity in the local community. 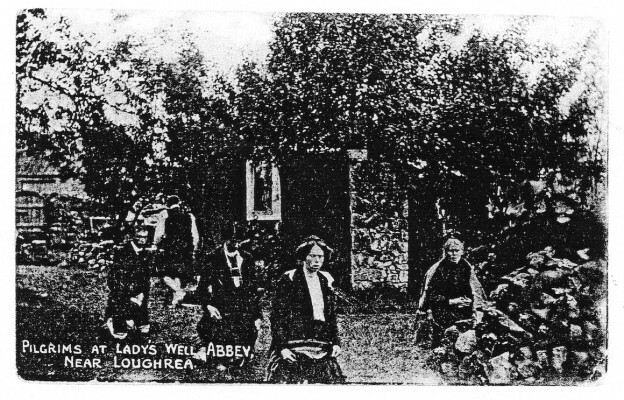 From reading the extract from De Latocnaye – John Stevenson’s book, it would appear that his arrival in Abbey was on the 15th August as this is the day when, traditionally, families visit Kilnalahan monastery and cemetery and also it is the date when people began their pilgrimage to Lady Well. The following is the extract from this book ‘A Frenchman’s Walk Through Ireland 1796-7’ translated from the French of De Latocnaye by John Stevenson. 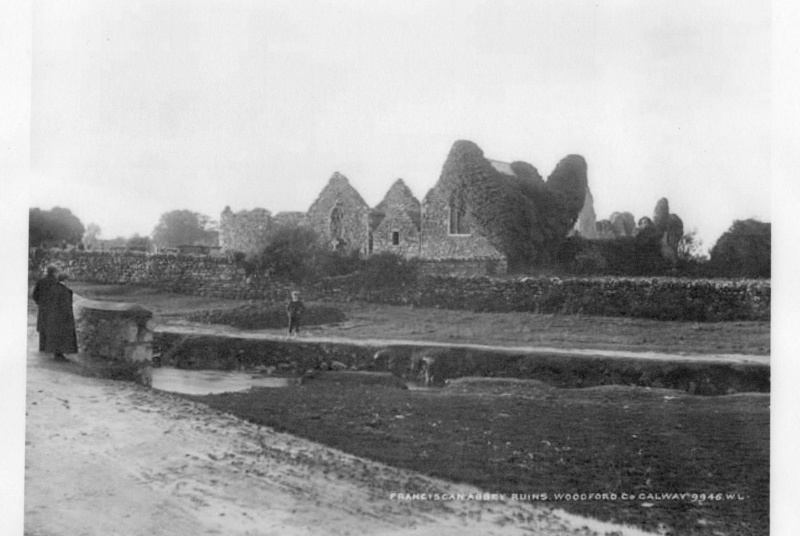 “Near Woodford the landscape begins to improve, and is rather pretty near a village called Abbey, on the confines of the provinces of Munster and Connaught. Formerly there was a considerable abbey here, with a church dedicated to the Virgin. It was a fête day on which I saw it, and the place was crowded. This ruin is one of the few of which the inhabitants have had the good sense to make use, so as to avoid the trouble and expense of building a new church. Catholics have lately obtained permission to use two of the lateral chapels, of which the vault remained intact; it is hardly possible to exaggerate the miserable look of these chapels and of the poor folk who frequent them. In the cemetery two or three priests were occupied in confessing the penitents. They sat on stones, and each held a little flag, which was used to separate the penitent from the crowd. The priests, as I am told, receive something for their trouble, according to a fixed tariff; this is said to be their principal source of income. After all, they must live, and it is only through the little charges they exact from the faithful that their kitchen can be kept going. I have, however, seen some, to my great surprise, who are by no means badly off, having between one and two hundred pounds sterling per annum of income, besides a passable house, and, according to custom, dinners without end with their parishioners who are in easy circumstances. The law allows to every Catholic priest who will turn Protestant the sum of forty pounds sterling per annum, to be paid by the county in which he lives; he has also the promise of the first curacy vacant. The insults which the people heap on the few who profit by these advantages are sufficient to disgust those whose conscience would allow them to place their temporal interests before all other considerations. However, the law is on the side of these, and yet I do not believe that there are a dozen of them in the whole of Ireland. I went to visit near this abbey a holy well of the place. It is not, like most of them, in open country; it is surrounded by houses, and although I was prepared for what I was to find there, I confess it was very difficult for me to retain a serious countenance before a score of women with their clothes tucked up, moving in single file round the enclosure on their bare knees. One had to think of the serious intention to avoid bursting into laughter on seeing the contortions of the devotees occasioned by the pebbles underneath, and in noticing the devices adopted to prevent the soiling of fine red petticoats …. Oh, Monsieur Twiss! What an occasion this would have been for you, and what remarks you would have made! … But I shall be more discreet than you were. (This extract is from pages 134 to 136 of the above named book). This page was added on 12/09/2014.